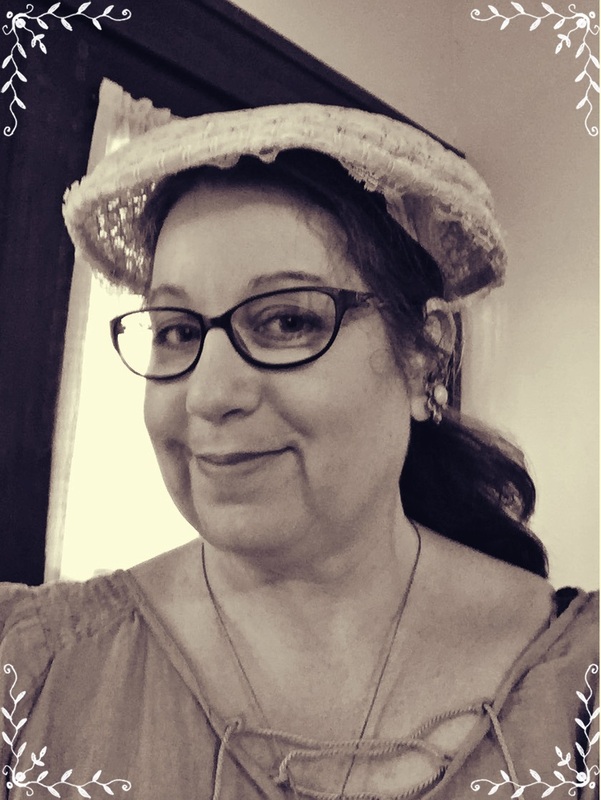 A ROCKETEER reader suggested the topic for this month’s From the Drafting Table column — changes in book and magazine font styles during the twentieth and early twenty-first centuries. Of course, this is a huge topic and I will cover only a small section of it, the common fonts used in the body text of books and magazines. You might wonder why anyone should care. Words are words, right? Unfortunately not. Our minds register something strange when an odd font is used. It may be that the kerning is off (the spacing between the letters), the capitols are impossible to read, the swashes are dangerously interfering of their neighboring letters, or the font itself is unreadable for other reasons. Font designers do us all a favor by understanding the basics of typesetting and type design. Letters are meant to fit well with other letters of their alphabets, not shine as individual peacocks. Serif fonts are considered the more readable for lines of text. The word serif refers to the short lines attached to the upper and lower ends of the strokes of a letter or symbol. At the end of the nineteenth and the beginning of the twentieth centuries “Old Style” fonts such as Century Schoolbook and Bookman were commonly used for books and pamphlets. The letters are large, well spaced, and easy to read. By the 1930’s and 40’s new fonts became popular — Palatino and Times New Roman amongst them. These mid-century fonts are slightly smaller and the kerning tighter but are still easy to read. 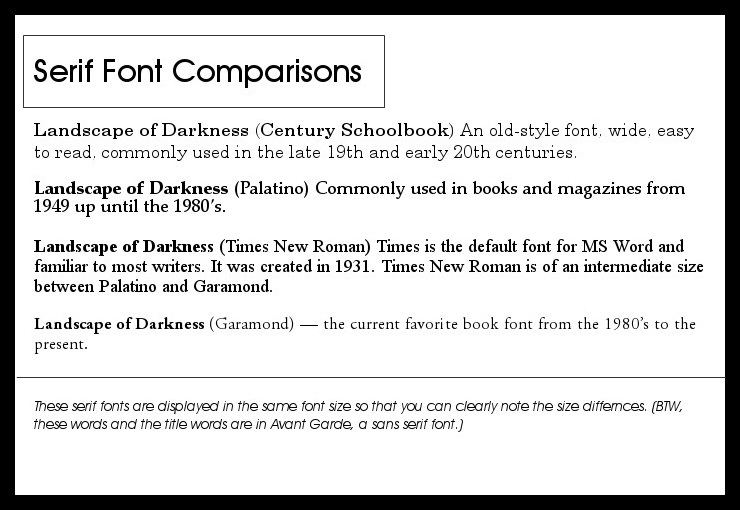 You’re probably already familiar with Times New Roman, the default font used in Microsoft Word. In the 1980’s the fashion of fonts changed again. To save on printing costs, publishers got rid of the traditional double space after periods, replacing it with a single space. They also changed to smaller and more compressed fonts which shortened page counts and further reduced printing costs. Garamond came to prominence during this decade and remains the typeface of choice for books today. San Serif fonts, which lack the attached short lines of Serifs, are difficult to read in long passages but good for contrast in headlines and subheadings. Creating contrast between headline and body text is an important tenet of design. 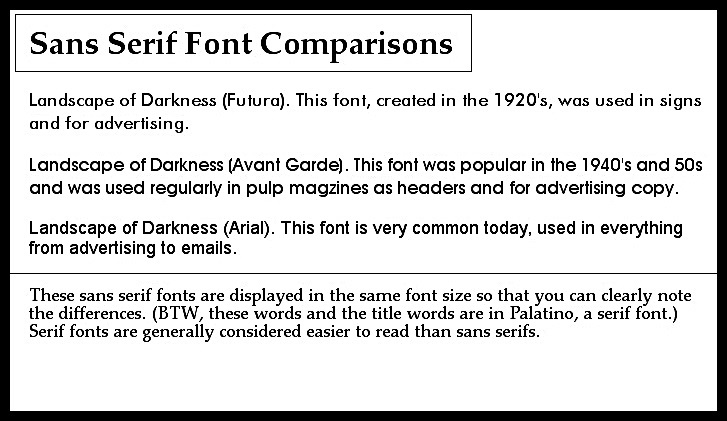 (However, using more than two or three fonts or font styles in one document confuses the eye and is a design no-no.) 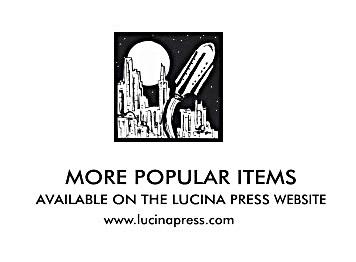 Futura was popular in the 1920’s and has a streamlined, modern look. By the 1950’s Futura was out and Avant Garde was in. Helvetica was in common use in the 1980’s and Arial is very popular today. Interestingly, modern readers are more accustomed to reading Sans Serif fonts than previous generations. This is because it is so often used on computer screens in both short and long passages of text. As previously mentioned, this is just the tip of the iceberg when it comes to font styles. Not only are there multitudes of fonts available but many variations on each style. A simple online search for the word “font” produces thousands of results. I originally set Landscape of Darkness in Century Schoolbook. What a disaster! The font was easy to read but it looked out-of-date and took up too much space. I knew readers would hate it. Equally, I dislike Garamond, it’s an ugly font to my eyes. Ultimately, I chose Palatino for my book’s body text. The font is time appropriate as it was first released in 1949/1950. The Sans Serif used for the book’s cover is Kabel, released in 1927. The showy interior chapter headers are in Britannic Bold, which has been around in one form or another since 1905. There’s an advertisement at the back of the book created to look like an ad in Thrilling Wonder Stories from the 1940’s. It uses the Sans Serif font, Avant Garde, and although deliberately ugly, it’s picture perfect to the period and I love it. The old-school ad seen in the back of my novelette, "Landscape of Darkness."